Emotionally engaging, superbly directed and ultimately moving drama with riveting performances from both Norton and Watts. 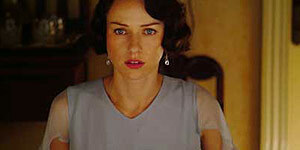 Based on the novel by W Somerset Maugham and set in the 1920s, The Painted Veil stars Naomi Watts as Kitty, an upper-class English woman who marries bacteriologist Walter Fane (Edward Norton) after a hurried courtship, partly to escape her stuffy surroundings and partly because her socially conscious mother is anxious she should marry as soon as possible. Walter and Kitty move to Shanghai, where the bored and spoiled Kitty has an ill-advised affair with married diplomat Charles Townsend (Liev Schreiber, Watts' real-life partner). Angered and humiliated by Kitty's affair, Walter insists she accompany him to an isolated cholera epidemic, where he proceeds to ignore her completely. However, as Kitty gradually discovers her own inner depths, Walter finally begins to soften towards her. Watts and Norton both deliver terrific performances, portraying complex and fascinating characters, neither of whom are especially likeable (for the first half of the film, at least). Their relationship exerts a genuine emotional pull, by turns awkward, frustrating, heartbreaking and ultimately moving. It's painful to watch them deliberately hurt each other and we're desperate for them to work things out. There's also superb support from Toby Jones (the other Capote) as a seedy ex-pat and from Diana Rigg as a worldly-wise French nun. In addition, the dialogue is excellent and Ron Nyswaner's superb script layers in some intriguing political overtones, adding extra tension to the ever-present threat of disease. The film is also beautifully shot, with striking cinematography, stunning production values and an impressive, award-winning score by everyone's favouritely named composer, Alexandre Desplat. There's even a tiny-but-welcome amount of comic relief, in the relationship between Kitty and her non-English speaking chaperone. In short, this is a superbly made, emotionally captivating drama with terrific performances from its two leads. Highly recommended.